NEW YORK (AP) — U.S. stock indexes are slipping for the second day in a row Wednesday as banks and small-company stocks continue to take steep losses. Energy companies are falling as the price of oil slides almost 4 percent. That’s canceling out gains for drug companies and household products makers. KEEPING SCORE: The Standard & Poor’s 500 index lost 5 points, or 0.2 percent, to 2,408 as of 11:25 a.m. Eastern time. 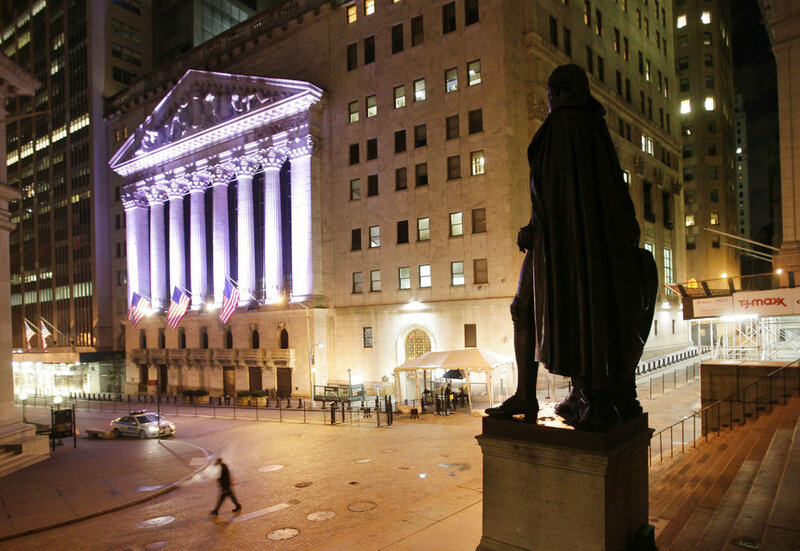 The Dow Jones industrial average dropped 29 points, or 0.1 percent, to 21,000. The Nasdaq composite fell 17 points, or 0.3 percent, to 6,186. The Russell 2000 index of small-company stocks again did worse than the other major indexes. It retreated 8 points, or 0.6 percent, to 1,363. BONDS: Bond prices rose, pushing yields lower. The yield on the 10-year Treasury note fell to 2.20 percent from 2.21 percent. Banks stocks continued to fall. Declining bond yields push interest rates on long-term loans lower, which hurts banks’ profits. JPMorgan Chase fell $1.47, or 1.7 percent, to $82.43 and Capital One slumped $1.68, or 2.1 percent, to $76.60. Other financial institutions also traded lower, including Goldman Sachs, which gave up $6.50, or 3 percent, to $211.92. ENERGY: Benchmark U.S. crude lost $1.83, or 3.7 percent, to $47.83 a barrel in New York. Brent crude, the standard for international oil prices, fell $1.94, or 3.7 percent, to $50.30 a barrel in London. Energy stocks continued to decline. Chevron sank 76 cents to $103.30 and pipeline operator Williams Cos. shed 50 cents, or 1.7 percent, to $28.19. FEELING BETTER: Some of the largest moves came from drugmakers. Pfizer rose 59 cents, or 1.8 percent, to $32.72 and Irish drugmaker Perrigo climbed $3.42, or 5 percent, to $71.34 after its first-quarter report was better than expected. Biotech companies Regeneron rose $5.62, or 1.3 percent, to $454.29 and Vertex added $2.61, or 2.2 percent, to $123. Health care products maker Johnson & Johnson advanced $1.39, or 1.1 percent, to $128.51. Household products companies also rose. Clorox gained $1.13 to $136.06 and Kimberly-Clark, which makes Huggies diapers and Kleenex tissue, picked up 48 cents to $87.88. Procter & Gamble, which makes Tide detergent and Charmin toilet paper, advanced $1.05 to $130.02. KORS GETS CORED: Michael Kors Holdings said it will close up to 125 stores as its sales have remained weak. The luxury retailer said sales at older stores dropped in its latest quarter and investors were disappointed with its projections for the current quarter. The stock tumbled $3.59, or 9.9 percent, to $32.68. It last traded that low in February 2012. HITTING RESET: Technology companies turned lower. The tech sector has reached its highest levels since the dot-com boom and companies like Apple, Google parent Alphabet and Facebook have done far better than the rest of the market in 2017. Apple and Facebook are up 32 percent this year, and Alphabet is up 25 percent. CURRENCIES: The dollar slipped to 110.55 yen from 110.78 yen. The euro rose to $1.1243 from $1.1188. The British pound rose to $1.2912 from $1.2813. The pound was volatile after polls and survey’s showed the general election on June 8 might be closer than expected. Early on, observers expected the Conservative Party of Prime Minister Theresa May to win in a landslide, but polls suggest the race could be close. May supports Britain’s exit from the European Union, and if she wins a smaller majority, it could hurt her side as Britain negotiates its departure from the union. OVERSEAS: France’s CAC 40 rose 0.7 percent and the German DAX gained 0.6 percent. In Britain, the FTSE 100 rose 0.2 percent. Japan’s Nikkei 225 index fell 0.1 percent and South Korea’s Kospi gained 0.2 percent. The Hang Seng in Hong Kong inched down 0.1 percent. Tags: banks, Energy Companines, stock market, U.S. Stock. Bookmark the permalink.